In 1987 a small and fairly unknown band would release a four song cassette demo that they would sell and distribute completely independent, and it would garnish great reviews in the underground white metal scene, which would start to pave the way for this band to make its mark on the metal world. Up next for this band in 1988 the band would get asked to contribute not one, but two tracks on a very high profile Christian Metal compilation on Regency Records entitled East Coast Metal and the band had now become a household name in the world of Christian Metal. That band was called TAKER and they were now poised to take the world by storm, between the success of their four song demo (which would get dubbed the ‘Matthew 11:12’ EP) and the East Coast Metal compilation, it was the start of what promised to be a very fruitful career for this young and energetic metal band from Northern Virginia. The band would play many high profile shows throughout their career with some of the biggest white metal bands of the time like White Cross, Believer, Second Chance, and even Haven. By the summer of 1989 they would complete one more five song EP entitled ‘Blood’ before the members would begin to move on to other musical projects and TAKER would officially call it a day. The ‘Blood’ EP would be their last official release and the world would never get to see another official release or any other additional material from TAKER, until now! 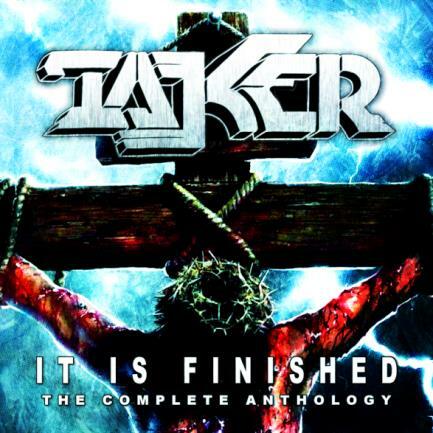 On April 1, 2014, Twenty Seven years after this bands humble beginnings Roxx Records is very proud to say that we will be releasing a long overdue full length release from TAKER entitled ‘It Is Finished – The Complete Anthology’. Roxx worked very close with Robert Bussey, one of the bands founding members, to come up with anything and everything we could find in the band’s recording history and personal archive. Once fully compiled with the best possible recordings we could find it was sent off to Sid ‘Ysidro’ Garcia (Deliverance, Ultimatum, Crossforce) to be completely remastered so that these long lost and nearly forgotten gems could be shared with the world one more time and for the first time EVER digitally and on CD! Check out exactly what we came up with for you here in this amazing compilation which encompasses all of the studio tracks the band ever recorded all remastered and all into one special CD release limited to only 300 copies worldwide. Rehearsal Song (Recorded Live) in between the release of the ‘Matthew 11:12’ EP and before the Image Records Recording Sessions in preparation for the opening slot on the very first White Cross East Coast tour. Lastly we also want to share with you the final artwork which makes quite the finishing touch to this truly collectible piece of white metal history from artist Brian Marshall of JBM Design. Please visit www.roxxproductions.com for all info on this special Limited Edition release and for the special pre-order package.